A bunch of PC makers got together and defined the various operating modes that ACPI PCs can be in. If everyone plays by the same rules there are no surprises, which is good for the entire ecosystem. S1 Low wake latency sleeping state. No system context is lost, hardware maintains all context. S3 All system context is lost except system memory (CPU, cache, chipset context all lost). S4 Lowest power, longest wake latency supported by ACPI. Hardware platform has powered off all devices, platform context is maintained. S5 Similar so S4 except OS doesn't save any context, requires complete boot upon wake. S0 is an operational system, while S1/S2 are various levels of idle that are transparent to the end user. S3 is otherwise known as Suspend to RAM (STR), while S4 is commonly known as hibernate or Suspend to Disk (this one is less frequently abbreviated for some reason...). These six sleeping states have served the PC well over the years. The addition of S3 gave us fast resume from sleep, something that's often exploited when you're on the go and need to quickly transition between using your notebook and carrying it around. The ultra mobile revolution however gave us a new requirement: the ability to transact data while in an otherwise deep sleep state. Your smartphone and tablet both fetch emails, grab Twitter updates, receive messages and calls while in their sleep state. The prevalence of always-on wireless connectivity in these devices makes all of this easy, but the PC/smartphone/tablet convergence guarantees that if the PC doesn't adopt similar functionality it won't survive in the new world. The solution is connected standby or active idle, a feature supported both by Haswell and Clovertrail as well as all of the currently shipping ARM based smartphones and tablets. Today, transitioning into S3 sleep is initiated by closing the lid on your notebook or telling the OS to go to sleep. 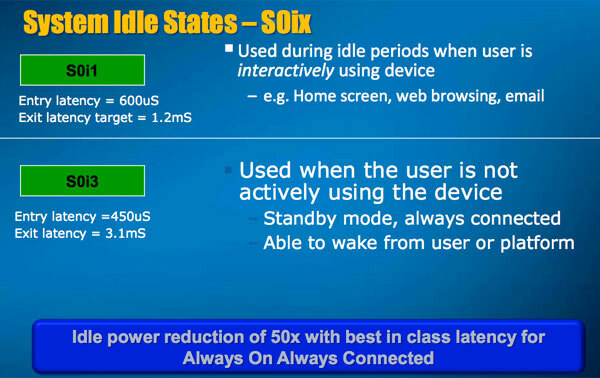 In Haswell (and Clovertrail), Intel introduced a new S0ix active idle state (there are multiple active idle states, e.g. S0i1, S0i3). These states promise to deliver the same power consumption as S3 sleep, but with a quick enough wake up time to get back into full S0 should you need to do something with your device. In Moorestown it takes 1ms to get out of S0i1 and only 3ms to get out of S0i3. I would expect Haswell's wakeup latencies to be similar. From the standpoint of a traditional CPU design, even 1ms is an eternity, but if you think about it from the end user perspective a 1 - 3ms wakeup delay is hardly noticeable especially when access latency is dominated by so many other factors in the chain (e.g. the network). What specifically happens in these active idle power states? In the past Intel focused on driving power down for all of the silicon it owned: the CPU, graphics core, chipset and even WiFi. 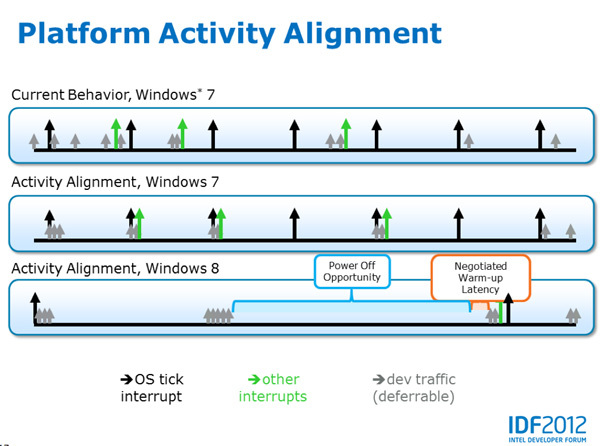 In order to make active idle a reality, Intel's reach had to extend beyond the components it makes. With Haswell U/ULT parts, Intel will actually go in and specify recommended components for the rest of the platform. I'm talking about everything from voltage regulators to random microcontrollers on the motherboard. Even more than actual component "suggestions", Intel will also list recommended firmwares for these components. Intel gave one example where an embedded controller on a motherboard was using 30 - 50mW of power. Through some simple firmware changes Intel was able to drop this particular controller's power consumption down to 5mW. It's not rocket science, but this is Intel's way of doing some of the work that its OEM partners should have been doing for the past decade. Apple has done some of this on its own (which is why OS X based notebooks still enjoy tangibly longer idle battery life than their Windows counterparts), but Intel will be offering this to many of its key OEM partners and in a significant way. 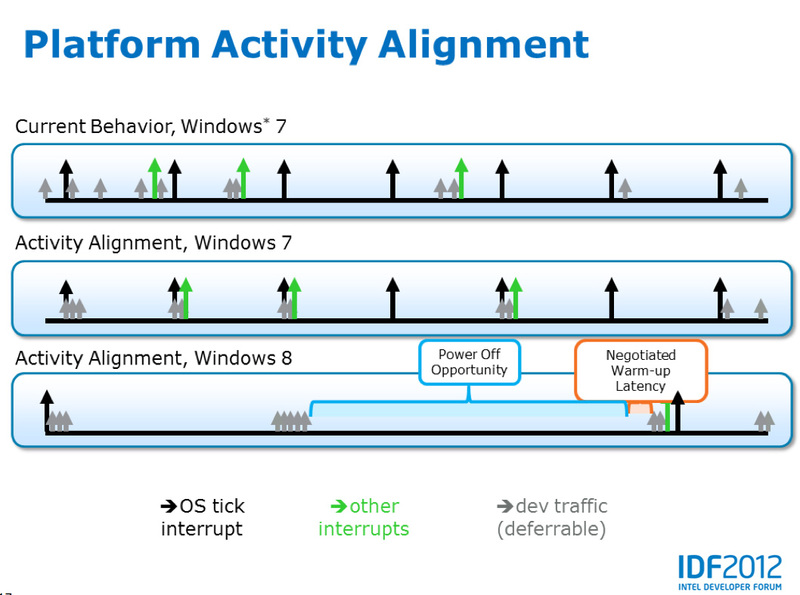 Intel's focus on everything else in the system extends beyond power consumption - it also needs to understand the latency tolerance of everything else in the system. The shift to active idle states is a new way of thinking. In the early days of client computing there was a real focus on allowing all off-CPU controllers to work autonomously. The result of years of evolution along those lines resulted in platforms where any and everything could transact data whenever it wanted to. Windows 8 is pretty much a requirement to get the full benefits, although with the right drivers in place you'll see some improvement on Windows 7 as well. As most of these platform level power enhancements are targeted at 3rd generation Ultrabooks/tablets it's highly unlikely you'll see Windows 7 ship on any of them. All of these platform level power optimizations really focus on components on the motherboard and shaving mWs here and there. There's still one major consumer of power budget that needs addressing as well: the display. For years Intel has been talking about Panel Self Refresh (PSR) being the holy grail of improving notebook battery life. The concept is simple: even when what's on your display isn't changing (staring at text, looking at your desktop, etc...) the CPU and GPU still have to wake up to refresh the panel 60 times a second. The refresh process isn't incredibly power hungry but it's more wasteful than it needs to be given that no useful work is actually being done. One solution is PSR. By including a little bit of DRAM on the panel itself, the display could store a copy of the frame buffer. In the event that nothing was changing on the screen, you could put the entire platform to sleep and refresh the panel by looping the same frame data stored in the panel's DRAM. The power savings would be tremendous as it'd allow your entire notebook/tablet/whatever to enter a virtual off state. You could get even more creative and start doing selective PSR where only parts of the display are updated and the rest remain in self-refresh mode (e.g. following a cursor, animating a live tile, etc...). Display makers have been resistant to PSR because of the fact that they now have to increase their bill of materials cost by adding DRAM to the panel. The race to the bottom that we've seen in the LCD space made it unlikely that any of the panel vendors would be jumping at the opportunity to make their products more expensive. Intel believes that this time things will be different. Half of the Haswell ULT panel vendors will be enabled with Panel Self Refresh over eDP. That doesn't mean that we'll see PSR used in those machines, but it's hopefully a good indication. Similar to what we've seen from Intel in the smartphone and tablet space, you can expect to see reference platforms built around Haswell to show OEMs exactly what they need to put down on a motherboard to deliver the sort of idle power consumption necessary to compete in the new world. It's not clear to me how Intel will enforce these guidelines, although it has a number of tools at its disposal - logo certification being the most obvious.